When you’re a victim of personal injury, it may feel like no one understands exactly what you’re going through. Pain, medical bills, and lost time from work are just a few struggles you endure. To make matters worse, you have to fight with the insurance companies to get the compensation you deserve. These companies are looking out for their bottom line rather, not for your best interests. If you’re feeling alone as you work hard to get your life back on track, let our team work for you. We’ve represented victims of personal injury throughout central and north central Ohio. We sympathize with you and are passionate about helping you. 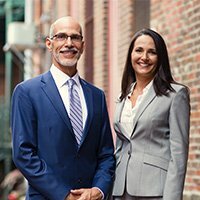 While each case is unique, we thoroughly understand the nuances of personal injury cases. While you begin the healing process, our team will guide you through the steps you should take to ensure fair compensation. Attorneys John K. Rinehardt, Hillary Rinehardt, and Melanie S. Fahey have represented clients in matters related to workplace injuries, motor vehicle accidents, medical malpractice, slip and fall accidents, dog bites, and more. We know how to work with insurance companies and doctors, and we will give your case the personal attention it deserves. "Our entire team will work for you." We keep an open line of communication with each of our clients. We want them to feel comfortable approaching us with questions, and we never want them to feel helpless in the face of their personal injury case. Everything we do hinges on our sympathy and passion for our clients. We can seek settlement or take your case all the way to court — either way, we will do so with compassion for your unique, individual needs. We’ve represented clients in a wide variety of personal injury cases throughout central and north central Ohio. You can trust in our experience, and we’ll use our knowledge to bring a strong approach to your case. You can look us up on Avvo, Martindale-Hubbell, and Google, where you can read online reviews from our clients. You’ll find consistently positive feedback on our attorneys’ skills and integrity. Insurance companies attempt to take advantage of injury victims when they are most vulnerable following a traumatic incident. First and foremost, our legal team will take over all communication with the insurance company to protect your rights. We will immediately take the important steps to preserve evidence and document the facts of the case while they are still fresh. We will help to connect you with the best medical professionals in your area to diagnose and treat your injuries. If you can’t afford medical treatment, you can get treatment based on a medical lien. This means you pay nothing up front. Instead, your medical bills will be paid from the settlement proceeds at the conclusion of your case. Once your injuries are diagnosed and treated, we will be in a position to place an appropriate settlement value on your personal injury claim and we will begin negotiations with the insurance company. We will tell the story of your case by organizing all documentation into a “demand package,” which we will submit to the at-fault insurance company. The demand package will provide a complete picture of everything you have gone through. The insurance company will review these documents and respond with an acceptance, a counter offer, or a rejection. We will communicate with you during this negotiation process and you will make all final decisions. The majority of our cases settle prior to filing a lawsuit in what is called the pre-litigation stage. When your case settles, you will sign a settlement release that officially closes your case in exchange for the agreed amount of financial compensation. At this stage, we will also negotiate with your medical providers to lower your bills to maximize the money in your pocket. If the insurance company’s offer is unfair, we will file a lawsuit on your behalf. This process will often result in higher settlement amounts when the insurance company is being unreasonable. Our law firm will pay for all litigation expenses so you don’t have to pay out of pocket. These costs will be reimbursed from the settlement at the conclusion of your case. From the start, we prepare every case as though it will go in front of a jury. This may require hiring experts who will testify in support of your case and gathering additional information from witnesses. A deposition is your opportunity to tell your story under oath. We will be by your side at every step during this process. We will also ask questions of the at-fault person and witnesses under oath to gather critical information to use at mediation or trial. Prior to a jury trial, your case will most likely go before a mediator. A mediator is a neutral party responsible for listening to both sides of the case and helping to facilitate settlement. Cases often settle at this stage if the mediator can help the insurance company recognize the full value of your case. From experience, we know the best mediators in the state of Ohio. The final step to getting you the compensation you deserve is through a jury trial. We are experienced trial lawyers and we will present the story of your case to a jury of your peers. After hearing all the evidence, the jury will decide the amount of financial compensation they believe is fair. Rinehardt Law Firm is the answer to your personal injury. Our team of attorneys and case managers have represented clients in in Mansfield and throughout central and north central Ohio for years. With every new client, we treat them as if they were part of our family by providing clear communication, building a strong relationship, and using our experience to provide legal guidance that’s in their best interests. We offer free consultations with no obligation, so don’t hesitate to contact our team about your legal matter.